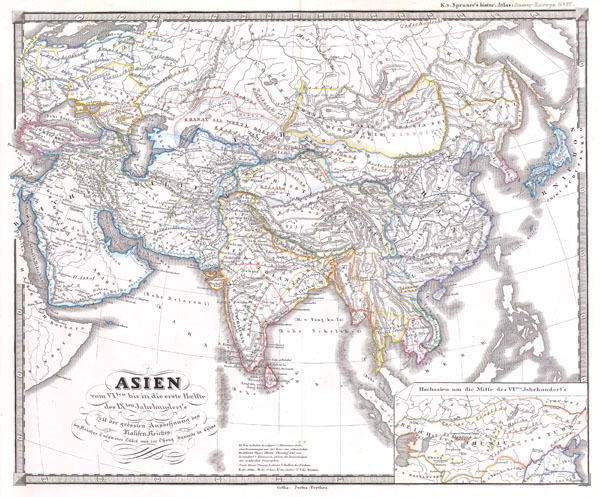 This fascinating hand colored map depicts Asia in the 6th through the 9th centuries. This period roughly corresponds to the Chang Dyansty in China and the Tufan kings of Tibet. Title roughly translates to 'Asia from the 6th through the first half of the 9th century. Time of the great expansion of the Kingdoms; the Tufan Kings ruled Tibet and the Chang Dynasty ruled in China..' All text is in German. This map was originaly part of the 1855 edition of Karl von Spruner's Historical Atlas.